All of the drawings in this gallery were created by Jeff Newman (me). I first created the screen saver around 1995. I believe there are people who purchased it back then who are still using it. Probably because I've been creating new drawings that can be easily downloaded and added to the screen saver. After all these years I still enjoy creating the drawings. The drawings below are in chronological order. Hopefully you can see how my drawings have improved over the years. Right-click on a drawing below. Select "Save link as" and save it to the Drawing Hand folder (typically c:\DrawingHand). Do not select "Save image as". Do not unzip the drawing. 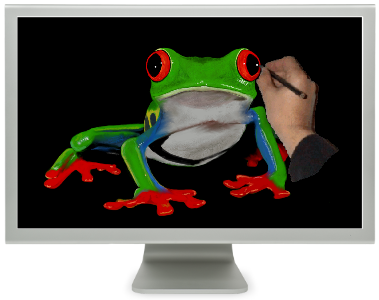 Double click on the Drawing Hand icon on your desktop. Click on Settings then select the Drawing tab. Place a checkmark next to the new drawing. The red eyed tree frog is absolutely amazing. It was fairly easy to draw. The key is the highlights and reflection. Powerful, graceful and intelligent. The elephant is an incredible animal. This drawing took a while to create but was worth the effort. I'm really happy with how it turned out. I would have loved to see one of these cool dudes in Hawaii! Maybe next time? Not much to say but this is one incredible cat! This was my version of one of Monet's earlier paintings. This seemed to be a popular drawing back in 2002. The idea behind this drawing was to align the eagle's beak (the tip of it's striking capability) with the F-15 Eagle. I was happy with how this drawing turned out. Can you figure out what is wrong with it? One of my most popular drawings. This drawing is small but the beauty is huge! My favorite face. This drawing is slightly larger than previous years. Computer monitors starting supporting higher resolutions. It was a very popular drawing when I first posted it back in 1999. This drawing was a tribute to an incredibly innovative and creative human being. This is one of my favorite drawings. Sometimes a drawing just works. I went through a period where I was trying to copy fine art paintings. I will post more of them in the future. This is one of my oldest drawings. I was still learning how to use the drawing program I created (ArtStudio).